Wednesday, October 24 from 6:45-7:30 p.m. 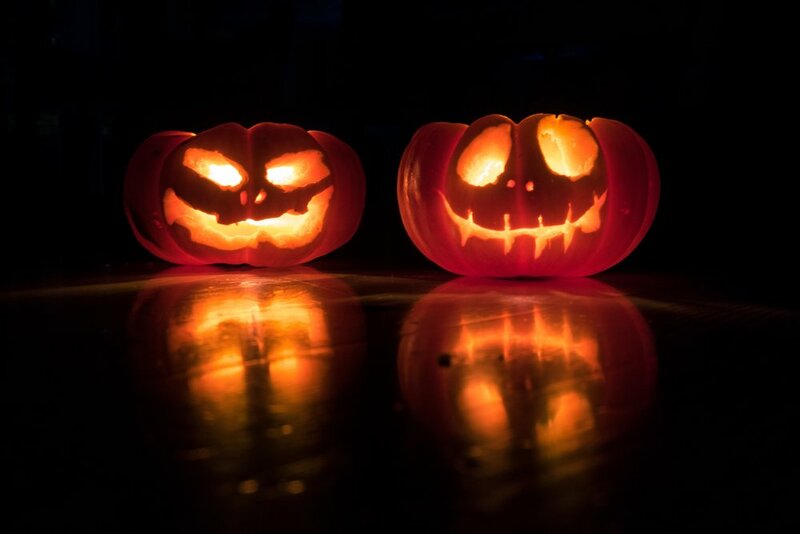 Looking for a safe, family-friendly way to trick or treat? Children ages 6th grade and under are invited to dress in costume and come trunk or treat in the church parking lot! "Trunk or Treat" cars will be parked in half the parking lot and roped off to incoming cars. Children then walk from trunk to trunk to collect candy. Trunk or treating will be from 6:45 - 7:30 p.m. All are welcome! Feeling creative? We are also in need of families and individuals who will decorate the trunk of their vehicles for this event! Please let Sara Dyson, Children and Family Minister, know if you can provide a trunk and approximately 300 pieces of candy. Trunks will need to be parked by 6:30 p.m. and will be asked to stay in the lot until 7:45 p.m.
Saturday, October 13 from 11:00 a.m. - 2:00 p.m. 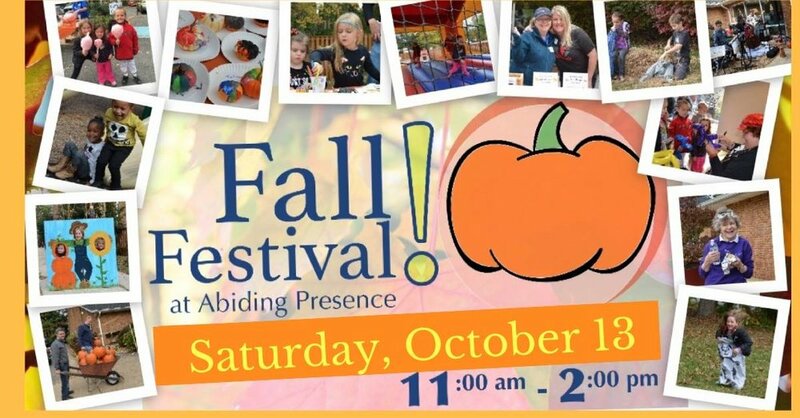 Abiding Presence offers a free community fall festival. Lots of volunteers are needed to make this event possible! Please consider volunteering for an hour shift (or more) before or after enjoying the festival by signing up here. The festival is completely FREE and offers food, games, live music, haunted houses, bouncy house, pumpkin paining, balloon artist, face painting and much more. The Fairfax County Sheriff's Office will be on hand to provide FREE Child Identification and Fingerprinting. Information on Internet safety for children and parents will also be provided. This completely FREE event is a great way to come celebrate fall with friends and neighbors. There will be several free raffles to enter, and gift cards given out throughout the day. Join us for a fun filled afternoon of FREE food, games, live music, haunted houses, bouncy house, pumpkin paining, balloon artist, face painting and much more. This completely FREE event is a great way to come celebrate fall with friends and neighbors. There will be several free raffles to enter, and gift cards given out throughout the day. 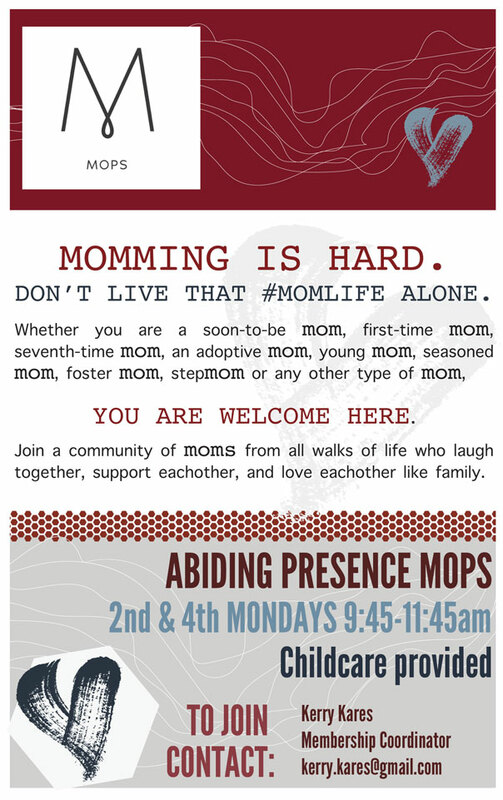 There will also be a collection of non-perishable foods to support the food pantry at Abiding Presence. Bring a few food items with you to the Fall Festival, or drop them off later in the week. It's time for our annual backpack, bag and briefcase blessing on Saturday, August 25 at 6:00 p.m. Bring to worship whatever bag you take out into the world to do God's work. There will be time during the service to bring your bag forward to be blessed and receive a blessing tag to remind you "God's Got Your Back!" All are welcome to attend this family friendly service! It will last approximately 55-60 minutes and include scripture, singing, prayers and Holy Communion. Our professionally staffed nursery will be open during the service for children who may not be in a worshiping mood. 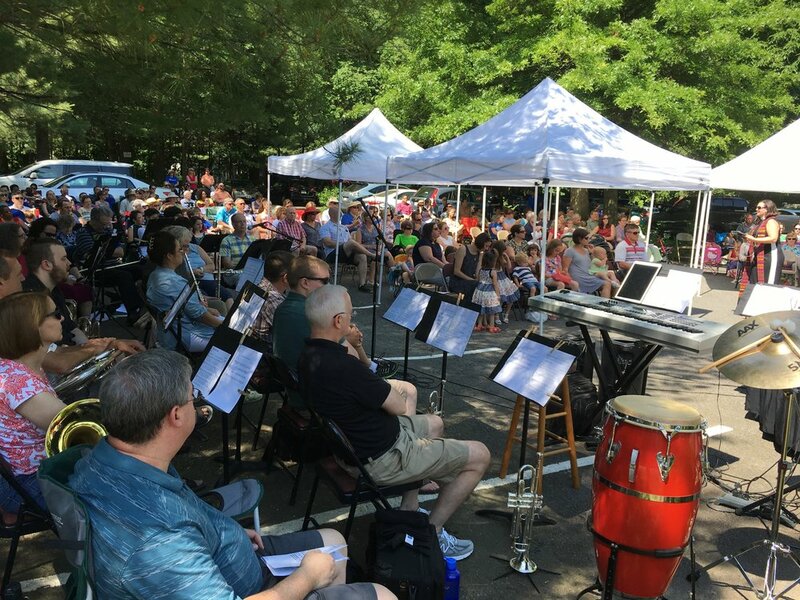 We're worshiping outside on Sunday, June 3 for our annual Outdoor Worship Service and Picnic. There will only be one Sunday morning service at 10:15 a.m. (Saturday worship will happen as usual at 6:00 p.m.) Grab a lawn chair or use one of the many folding chairs we'll have set up. After a 45 minute worship service with Holy Communion, we'll have a picnic. There will be a moonbounce by the playground for the kids. The church will provide hamburgers, hot dogs and drinks. Each family is asked to bring a side dish or dessert to share. We welcome all from the community to join us! It's a great service to invite a friend or neighbor to come along. If you are able to help with the picnic, please contact the church office. Hot Dogs & S'mores is a favorite summer kick off activity at Abiding Presence! 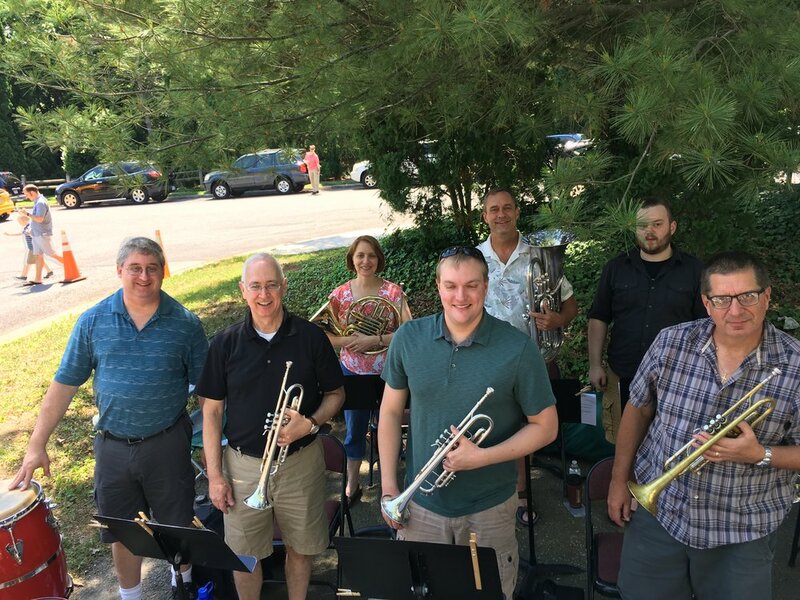 We'll be out on the church patio (weather permitting) Wednesdays, May 30, June 6 and June 13 beginning at 6:15 p.m. We provide all of the hot dogs, fixings and s'mores components. You simply show up! The fire will be ready to go and you can roast your hot dog over the hot coals and make your s'mores. After dinner, head over to the playground to play. A freewill donation is collected for the meal. We welcome anyone in the community to join us! Help is always needed and appreciated with set up and/or clean up. Contact Sara Dyson, Children and Family Minister, if you can lend a hand one of the nights. VBS Registration for 2018 is currently closed and we are on a waitlist. Go to www.abidingpresence.net/vbs for more information. Click to register, to volunteer, or to get a preview! Hosanna in the highest! Join us for worship as we have the procession of the palms at the beginning of both worship services at 8:45 am and 11:00 am. Between services at 9:45 am, couples, adults, families, and children of all ages are invited to participate in a Palm Sunday Festival that will be held in place of the Abiding Table and Sunday School. 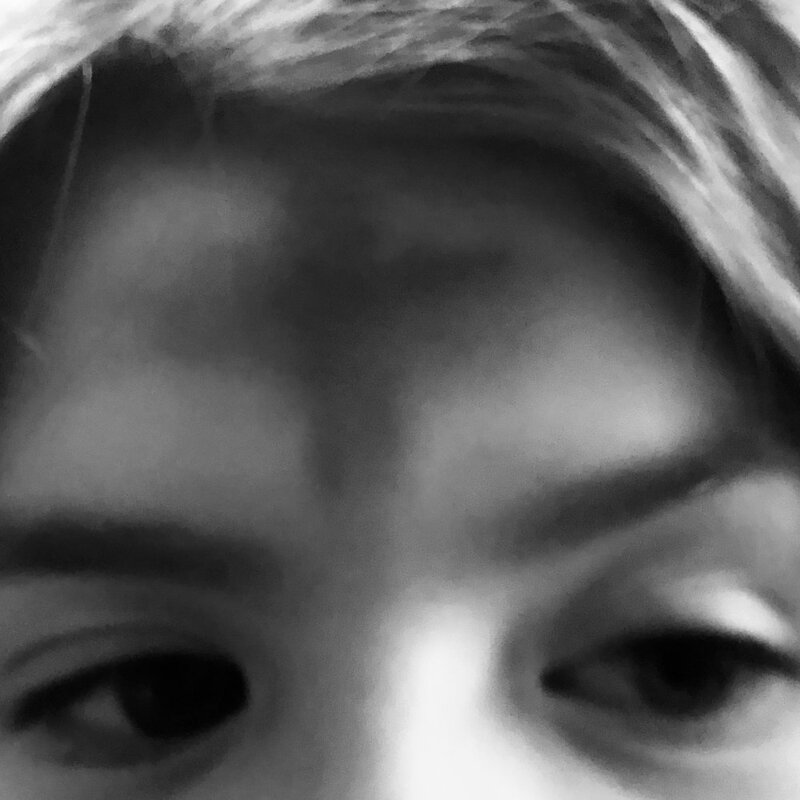 Adults and families will travel together to stations of many kinds to experience what Jesus went through, to reflect with different generations, to pray, and to prepare for the Holy Week journey to Easter. If you would like to volunteer to head up a station, please talk to Sara Dyson (sara@abidingpresence.net). 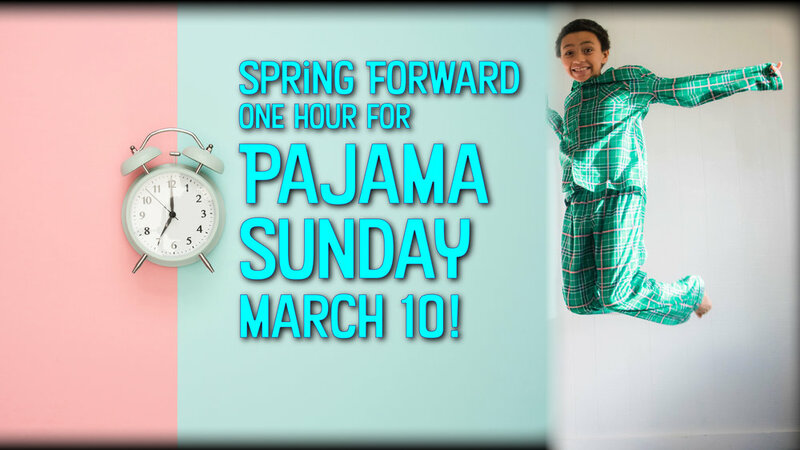 Daylight Saving Time starts this Sunday, March 11, 2018, at 2:00 a.m. (clocks spring forward to 3:00 a.m.). If you use your phone for your alarm, know that most smartphones will automatically update the time. If you're not sure, double check your phone's settings (instructions for iPhone | instructions for Android). You can always come to our Saturday 6:00 p.m. Vespers service with Holy Communion. Bored? Learn more about DST! Or, check out this list of 9 Things to Do biannually when DST starts or ends.